The Chinese game streaming stock was hit hard amid a market pullback and a concerning move from the country's entertainment regulators. 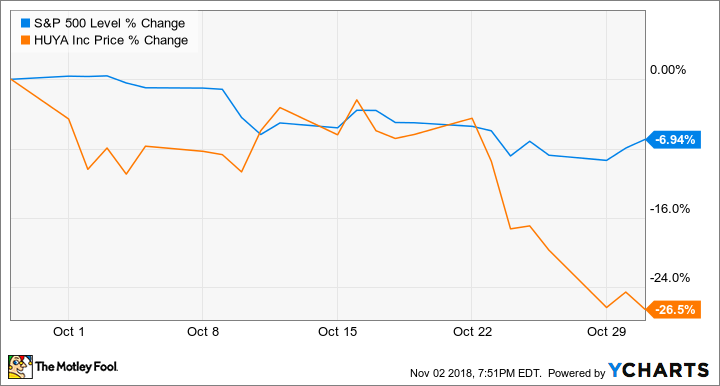 Shares of Huya (NYSE:HUYA) sank 26.5% in October, according to data provided by S&P Global Market Intelligence. The video game streaming stock posted explosive gains following its initial public offering in May due to expectations for rapid sales and earnings growth, so it's not surprising that shares underperformed the broader market amid last month's pullback and concerns about increased interference from Chinese regulators. While Huya stock is still up roughly 55% on the year, the last six months have seen steep sell-offs for the Chinese technology sector. Even after recently regaining some ground, the Invesco China Technology ETF (which bundles together 74 different Chinese tech stocks and is a good reflection of the industry's performance) is down roughly 30% year to date. Huya's performance is impressive against that backdrop -- even as shares trade down roughly 60% from the lifetime high hit in June -- but big questions about the business's outlook remain. In addition to sell-offs in conjunction with the broader market, Huya stock was negatively impacted by news that Chinese regulators had closed the last remaining avenue to having new video games approved for release in the country. The government halted its main approval process for new titles in August as it restructured departments involved with evaluating and approving entertainment content, but it had previously offered a different, more difficult path to getting a release license. That changed on Oct. 23, as the country moved to a complete freeze on new game approvals. The suspension should be temporary as the country reorganizes its entertainment-related regulatory bodies. However, China's government has shown an interest in curbing potentially offensive content and the time that citizens spend playing video games, so investors should proceed with the understanding that Huya's outlook could shift with new regulatory actions. Following an outright ban on Amazon's Twitch in the country, Rival platform Douyu's app was taken down from the Chinese iOS store early in October, and its Android version was put into limited functionality that prevented new content uploads and donations to streamers. It's not clear exactly what triggered these actions, but it's possible that they stemmed from needing to remove content or alter platform mechanics in order to bring them into compliance with government requests or standards. Like Douyu, Huya's business model hinges on taking a portion of donations to streamers, and it's not unlikely that the company will need to more aggressively moderate content or rework elements of its platform to stay in the good graces of regulators. Huya has otherwise been posting rapid sales growth, recording a 125% year-over-year increase in its June quarter to reach sales of roughly $157 million, and has promising growth avenues as long as it can comply with government standards. The market for gaming-video content appears poised for growth as esports continues to gain ground and the overall video game market expands. Huya has the potential to benefit from demand tailwinds in its industry and the growth of the Chinese middle class as long as the company can keep its expenses under control while navigating content standards. There's generally a heightened degree of uncertainty that comes with Chinese tech stocks, and the regulatory climate in the gaming industry adds extra variables, so investors should proceed with the understanding that Huya stock falls in the high-risk, high-reward category. 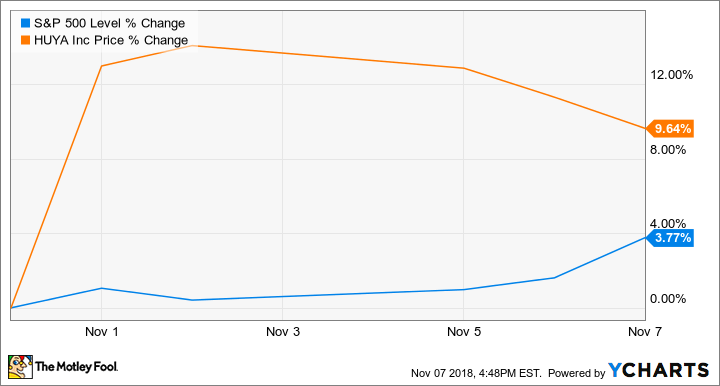 Huya stock has seen some recovery early in November, gaining ground along with the broader market and posting gains of roughly 9.6% through the month so far. Shares got a big lift on Nov. 1, following comments from President Trump suggesting that there had been progress on trade talks between the U.S. and China and that a trade agreement could be forthcoming. Huya generates virtually all of its business from the Chinese market and, aside from the threat of macroeconomic slowdown, isn't particularly vulnerable to trade-war risks. However, the company's growth-dependent valuation means that shares can still be expected to post big swings in conjunction with the trade outlook. the broader market's movement, and new regulatory actions from the Chinese government. Huya is scheduled to report third-quarter earnings after market close on Nov. 12. The company is guiding for revenue between RMB 1.19 billion and RMB 1.22 billion, representing year-over-year growth of 106.5% at the midpoint of the target; performance for the quarter could offer some insight on the extent to which the company has been affected by changing conditions in China's video game industry.